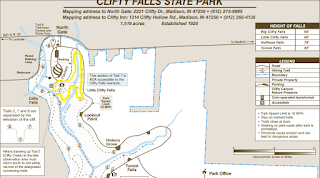 Our second hike at Clifty Falls was trail 7, which would take us to the other two named waterfalls in the state park Big and Little Clifty Falls. We decided to do the trail "backwards" so we could end with the waterfalls instead of beginning with them. The trailhead for this is a little past the parking lot and playground area (park your car and head to the left of the playground). By this time it had warmed up a bit and gotten much sunnier than it was earlier in the afternoon. Trail 7 was very pretty and had a small creek in view for most of it. We crossed over a short bridge and had a great view of the creek. The creek also has a small, unnamed but nice waterfall. About halfway through the trail, we came to a large staircase. There weren't any signs and we just assumed we should take the stairs down. 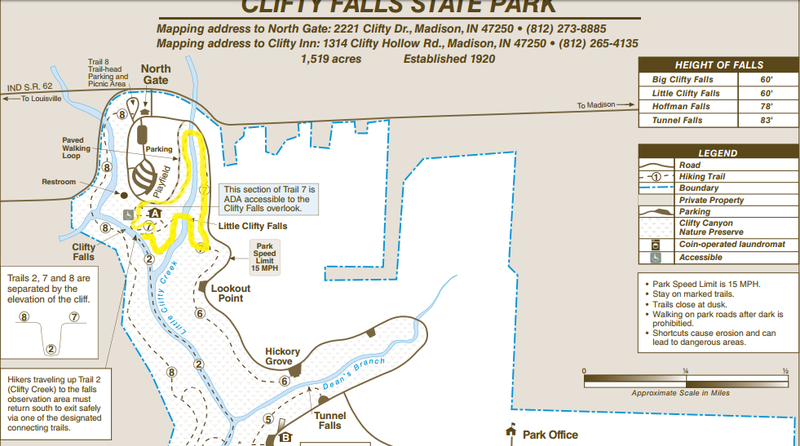 This led us to Little Clifty Falls, which you can walk right over on the bridge. Several other people were here enjoying the falls as well. I liked this waterfall the best of the four named ones, mostly because we could be right next to it. Continuing on the trail, we came to a fork in the path -- turn left or go straight. We went left and found a giant leaning rock (Cake Rock) that is not listed on the map. You can see Eric trying to tip the rock over here. I was surprised a named rock wasn't on the guide map. Eventually we came to another path decision and we went left again. It leads you to a dead end under a rock overhang (it looks like you used to be able to continue on, but it is now blocked off) with a view of Big Clifty Falls. We backtracked and made our way up to the accessible part of the trail (paved), which also has a nice overlook for Big Clifty Falls. We enjoyed our time in the park, even if the water wasn't as full as we thought it would be. The hikes are a little more strenuous than others which was a lot of fun. If you're in Madison or the surrounding area, I recommend checking it out! 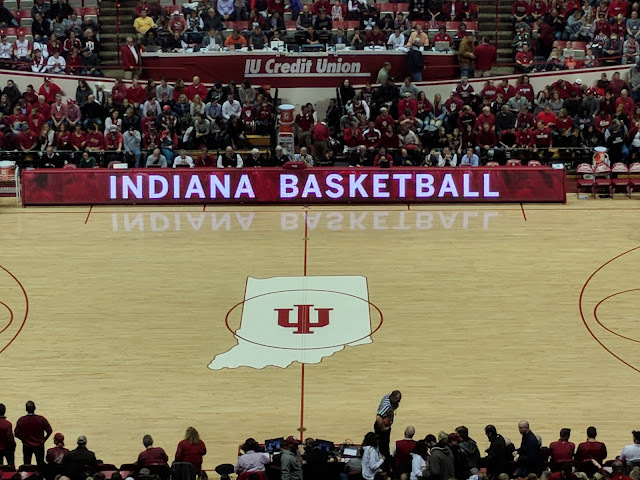 ($7 for Indiana license plates, $9 for out of state; $50 for a 2016 Indiana State Parks pass for unlimited entry into IN State Parks).